Enterprise IT needs to push their app providers on this. On day three of Enterprise Connect, I conducted a session on the feasibility of multivendor team collaboration with panelists from 8x8, Microsoft, Mitel, Symphony, and World Wide Technology -- two UC vendors, two pure-plays, and one systems integrator (see related article), so a good balance. As a first question, I asked everyone to comment on whether businesses actually needed multivendor team collaboration. It was a bit of a softball question, and to no surprise everyone agreed to the need, and admitted that multivendor team collaboration doesn't exist. The only vendor able to claim multivendor capabilities is 8x8, which can facilitate multivendor messaging for a number of vendors via the Sameroom product it acquired last year. Accomplishing this has required an incredible amount of hard work, as there are no standards for how team collaboration tools work. One of the Sameroom use cases, which is to enable the same vendor to interoperate with itself within different organizations, highlights just how hard multivendor interoperability is to achieve. I then drilled down on whether companies should standardize on a single vendor's team collaboration app or try making products from multiple vendors work. While not unanimous, the consensus is that companies should work toward having a single option, but in actuality shadow IT will be a factor, with lines of business (LOB) procuring their own team collaboration tools. If you look across the UC industry, standardizing on one vendor for anything has typically been difficult for organizations of any size as there are always new vendors popping up. In addition, the goal of maintaining a single vendor environment can be derailed by mergers and acquisitions. I recall a discussion with the CIO of one of the nation's largest banks, which was trying to standardize on Cisco for call control. At first when the bank acquired another, it would rip out the solution at the acquired organization and replace it with Cisco. But it soon found this was an expensive process, and eventually ditched the plan. The panelists identified Slack as having the highest penetration rate within LOB, and is the most difficult to take out for the vendors that sell through the IT organization. They provided some fascinating feedback on Slack -- it tends to get very expensive, very fast, and has some security issues... but, because end users love it, it sticks around. One of the audience participants, a younger-generation IT professional, reinforced this reality. He said the average age of employees at his company is 26, and Slack is overwhelmingly popular with users. He has about 6,000 users, and said he felt Slack's enterprise pricing was far too expensive and wanted to use Microsoft or another of the corporate-grade solutions but the user community wouldn't stand for it. So, instead of fighting the tide, he gave in and gave the employees what they wanted. This made his users extremely happy. Given the high cost, he purchased Slack with a single team license and put all 6,000 users in that team. He admitted the interface was "a little crowded" but even with that users are happy. His decision was interesting because it flies in the face of the way IT has operated for decades. Historically IT would make the decision on what applications get used, even if shadow IT has been involved. Consider how CRM was brought into most organizations. Initially, the various departments within companies were using different CRM systems. Eventually, IT got involved and made a decision on which one to standardize on. In fact, even UC evolved this way, with many users initially using apps like AOL Instant Messenger, Skype, and Yahoo Messenger. Eventually, IT would pick a solution that made the most sense for the business. Team collaboration is the first app where the workers, primarily millennials, are having a huge influence on which gets used -- and that's not good news for the traditional IT vendors. 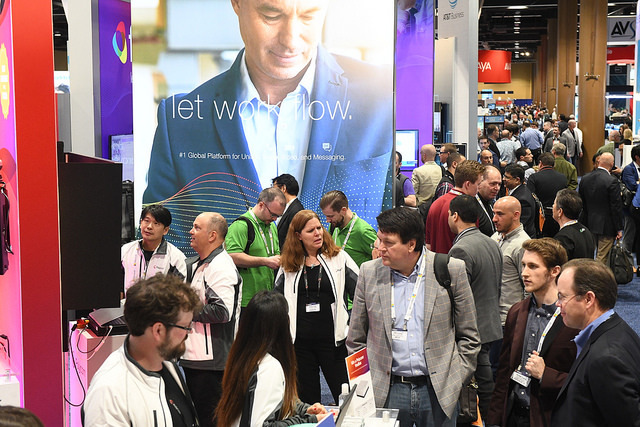 Brands like Cisco and Microsoft may be popular with the Enterprise Connect audience and win "best of show," but are viewed as old and stodgy by millennials. You could take an "if you can't beat them, join them" approach and interoperate with Slack, but legacy UC vendors don't seem to have much interest in this. I specifically asked my Microsoft panelist, Dan Stevenson, if the company would consider doing that, and he admitted that wasn't a priority. The title of my previous post asked the question: "Is multivendor team collaboration feasible?" Based on the panel, the answer is a resounding no. I understand Sameroom can do a limited amount of interoperability, but it's not the panacea to this problem. I urge the vendor community to take this problem seriously and agree on some standards to facilitate interoperability, as that will create a rising tide that will lift all boats. Consider the video conferencing market. Historically, systems wouldn't interoperate so it severely limited video use. Now that systems can talk to one another, usage has gone through the roof. Team collaboration is very popular today and has game-changing potential, but the vendor community risks frustrating users and limiting adoption by building walled gardens around themselves. Open, standards-based interoperability must be a focus for the entire community. One vendor can't make this happen; it needs the focus of everyone.